I have a spiralizer recipe for you today! It’s Vegan Pad Thai Salad over Spiralized Zucchini from The Little Vegan Cookbook. It’s a compilation cookbook from Fair Winds Press that includes recipes from 10 different authors. I really wish they credited each recipe in the book with the author’s name and the book it came from. That would make it easier to go back and buy more books based on the recipes you end up loving. 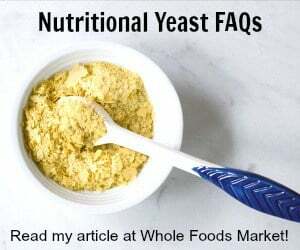 The authors do receive royalties from book sales, but I think Fair Winds could sell more books if they clearly stated where each recipe was from. It was probably because of space, but it was still a lost opportunity. But you can find out where many of the recipes are from. A quick google search let me know that the recipe I’m printing today is originally from Great Gluten-free Vegan Eats by Allyson Kramer. I love her, so it comes as no surprise, and I recommend that you take a look through her books. I love Allyson's recipes and this perfect summer recipe is originally from her book, Great Gluten-free Vegan Eats. 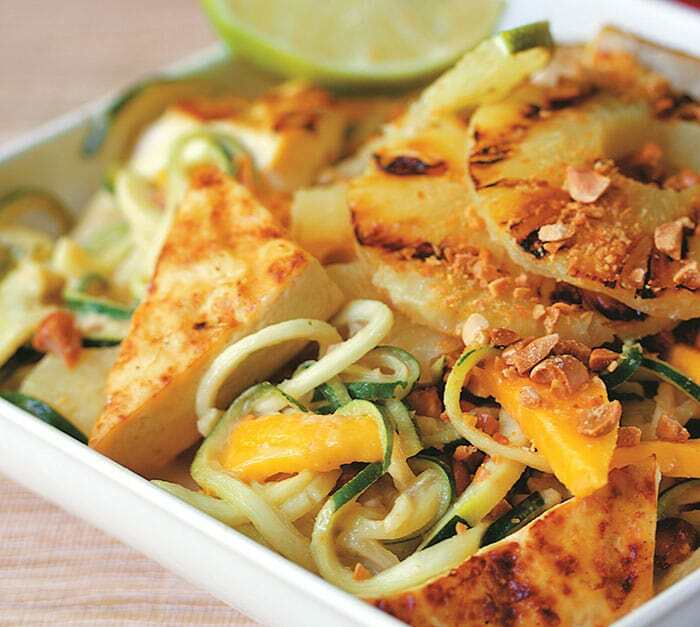 This salad is similar to pad Thai, but made with raw zucchini “noodles.” It’s hearty enough to serve as a meal because it contains grilled pineapple and tofu. Halve the tofu, making two rectangles about ½-inch (1.3 cm) thick. Cut them into bite-size triangles. In a medium baking dish, arrange the tofu in a single layer. To make the marinade: In a bowl, whisk all of ingredients together. Pour the marinade over the tofu. Marinate for at least 2 hours, flipping the tofu halfway through. Remove the tofu from the dish, reserving the leftover marinade. Grill the tofu and the pineapple rings on an electric indoor grill (or a mesh grill pan placed on an outdoor grill) for 10 to 15 minutes, or until golden brown on both sides, flipping if necessary. To make the zucchini noodles: Remove the ends from the zucchini and peel if desired. 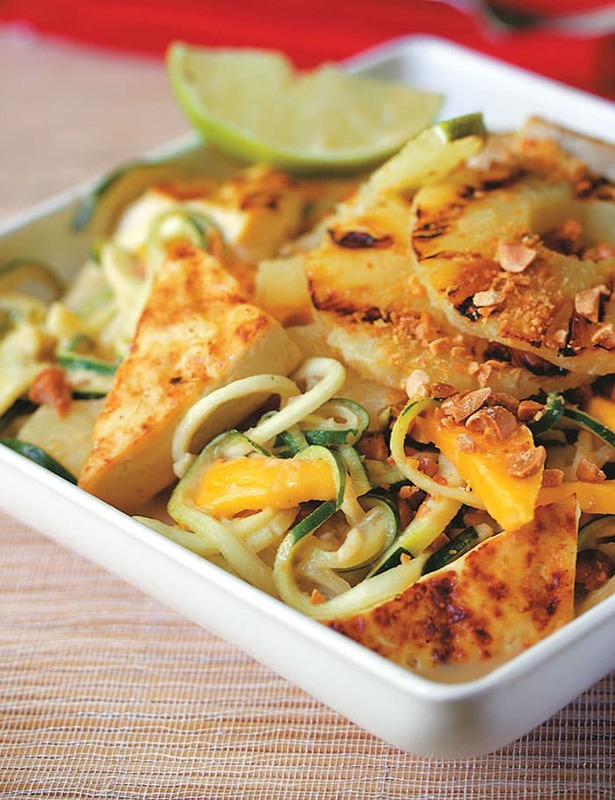 Using a vegetable spiralizer or vegetable peeler, cut the zucchini into long noodle-like strips, chopping into shorter “noodles” if necessary, and place in a large bowl. To make the dressing: In a bowl, whisk all of the dressing ingredients until smooth. (The dressing will be quite soupy.) Add more tamari to taste, if desired. Pour the dressing over the zucchini noodles and mix together until well coated, allowing the excess to remain at the bottom of the bowl. The book is full of 500 recipes, so you’ll never be at a loss for what to make for dinner, breakfast or dessert. There are photos, but they are not with each recipe, but in collages in a few pages clustered in the chapters. It is also a smaller size than most cookbooks with smaller print. If you have trouble reading small print, I’d suggest buying the e-book version, so you can adjust the size on your e-reader. That’s why I love my ipad, but some of the Kindle Fire Tablets are less than $50 if you have been thinking about getting one. « Have a Vegan Picnic for Memorial Day or 4th of July! About your message: I agree with you about giving each author credit. When I copy a recipe and put it into my file, I add: Courtesy of Kathy Hester – Healthy Slow Cooking underneath the name of the recipe. I wish more authors would do that. I used to print out the recipes and later, I wouldn’t have any idea who created it. Very frustrating when you want to their website for more. An idea for the publishers would be to list each author followed by all the recipes in that book. Of course, it would be great to have a complete list of their cookbooks, but maybe we’re asking too much! Thanks Kathy, another winning recipe…YUM! This is a very handy book- the not knowing who made what drives me crazy because I like to know things. This looks like a very satisfying summer dish! Does he have a slow cooker or Instant Pot? 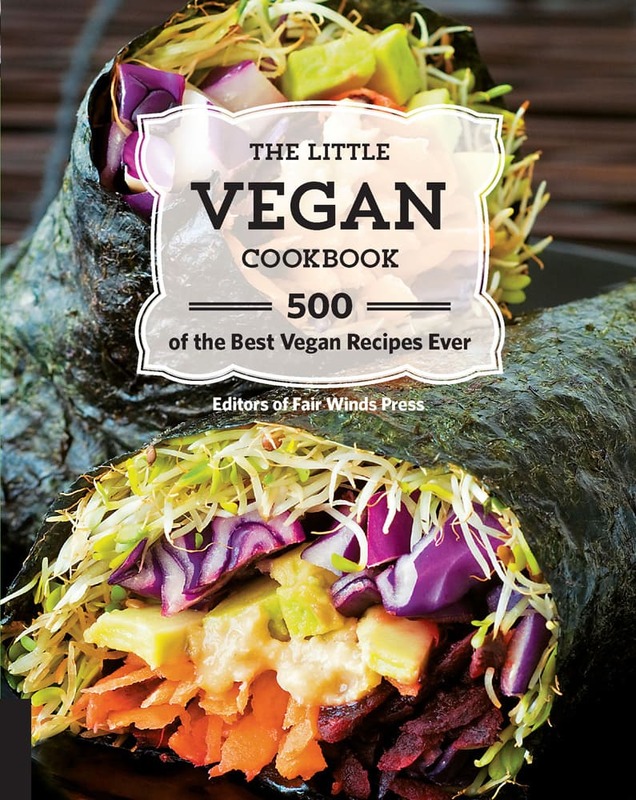 If not The Easy Vegan Cookbook really is easy! I don’t see tofu listed in the ingredients!